SAT I and ACT Reading Tests: Analysis Paralysis! 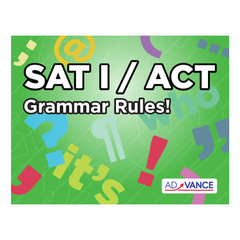 Are you an honors English student who cannot seem to get your Reading SAT I score or your ACT Reading score to move? Are you frustrated because you believe these scores are not reflective of your reading comprehension skills as compared to those of your peers in AP Language classes? If so, have you ever considered that your personality might play a part in your test-taking process? In the late 1990’s, when I was deciding whether or not to launch a home-based test prep business in San Diego, there was a lot of discussion nationally about whether the SAT I was an IQ test, one that tested a student’s general ability or aptitude. This discussion was led by Richard Atkinson, who became president of the UC System in 1995. Early in 2001 he recommended that the SAT college entrance examination be eliminated as a requirement of admission to the University of California and that it be replaced by a test that tested a student’s academic achievement. His recommendations resulted in a re-designed SAT I test in 2005 that included more advanced mathematics, as well as writing. His reasoning was these are skills needed if a student is to be successful in college. So I decided that I should use myself as a test case. In my fifties at the time and working as director of an educational learning center that taught test prep, I took a test through the College Board. I was confident that my score would be stellar, for I was three times older than my competitors, and I had been on this earth three times longer so I should know more! Right? Well, I soon found out how wrong I was! My score on the test was a 1250 out of 1600 (800 Verbal / 800 Math), which was much lower than I had expected. But what was most interesting to me was that my weakest area of performance was reading comprehension, and I am an English teacher! I spent three months taking test after test to see if I could raise my own score. And at the end of the three months I was able to score consistently in the 1500’s. What my prep process and my improved test score proved to me is that the SAT I is not an IQ test; it is a learned test. Yes, I had gotten straight A’s in high school, but I had to work for every A I ever got so I know my IQ is not spectacularly high. So why did I score so poorly on the Verbal part of the SAT I? Well, it is not because my reading comprehension skills are weak. The answer is that I was over-analyzing! This is what bright people do. A perfectionist by nature, I did not take the test in a black-and-white fashion. I did not go back to the text to find the answer, but rather tried to read too much into what was not stated. It took some effort to overcome this test-taking obstacle. After all, I had to try to change a part of my personality, an integral part of who I am! But the good news was that this obstacle was not linked to my IQ so perhaps I could raise my reading test scores if I became aware of how this behavior affected my taking the reading portions of these tests. Exactly what was the process I used to address this problem? Here it is: every time I missed a reading passage question, I would try to figure out why my wrong answer was not as good as the correct one. After doing this process for a while, I was able to understand that there was always a word or phrase that made the wrong answer wrong. There were always words in the correct answer that paraphrased the words in the passage. Or, sometimes the words in the correct answer would actual be the exact word or phrases that would appear in the passage. Over time, I learned to trust this process, which I call “getting inside the head of the test-writers”, because my reading comprehension scores did go up. This is the process I have been using for over two decades with my own students, and it does work if only the student is willing put in the time and the effort. One final note: this process can only work if you take REAL College Board or ACT written tests. Using practice tests written by Princeton Review or Kaplan, for example, will not enable you to learn the subtleties of the test.